The meeting of Olga Oleinikova, Director of Erasmus Plus Office in Russia, with the staff members of the National Centre for Public Accreditation and the Scientific and Research Institute of the Education Quality Monitoring was held on March 29, 2016. Since 2014 the National Centre for Public Accreditation takes active part in Tempus IV project “Achieving and Checking the Alignment between Academic Programmes and Qualification Framework”. In the frameworks of this event the experts had an opportunity to share the experience of participation in the project and discuss issues related to the perspectives of further cooperation. 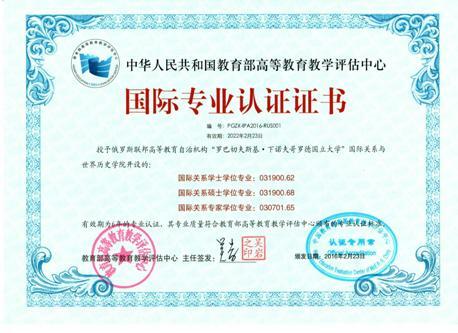 The Higher Education Evaluation Centre of the Ministry of Education, HEEC (China) in the frameworks of international accreditation procedure conducted jointly with the National Centre for Public Accreditation made a positive accreditation decision and issued a certificate of joint international accreditation of the two clusters of educational programmes “International Relations” (031900.62, 031900.68, 030701.65), "Chemistry" (020100.62, 020100.68) of the Lobachevsky State University of Nizhni Novgorod for the period of 6 years. On the Russian side the decision was made by the National Accreditation Board. 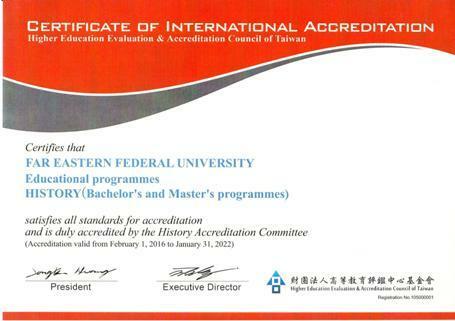 The Higher Education Evaluation and Accreditation Council of Taiwan – HEEACT (Taipei, Taiwan) in the frameworks of international accreditation procedure conducted jointly with the National Centre for Public Accreditation made a positive accreditation decision and issued a certificate of international accreditation of the educational programmes “History” (Bachelor’s and Master’s programmes) of the Far-Eastern Federal University for the period of 6 years. On the Russian side the decision was made by the National Accreditation Board. On January 21, 2016 the renewed National Accreditation Board started its work. According to the Regulations on the National Accreditation Board one-third of its members is renewed once in three years.